The Immaculate Touchception. It was just perfect. Last night goes down, hands down, as the most entertaining finish to a NFL football game in history. Just a complete debacle. It also goes down as my favorite night in the history of twitter. Players, current and former, calling out Goodell and the replacement jokes on the field. Complete chaos and mayhem. It was like texting every one of your buddies simultaneously in complete and utter disbelief at the scene that had just unfolded before your eyes. Only twitter is funnier than all your friends. I, for one, was spitting fire on twitter last night. So hot it has to be seen by all you non-twittering lobsters. I know this is challenging, but start from the bottom, and work your way up. Start with me commenting on Mike Goff’s tweet, which was an in-game comment, well before The Immaculate Touchception… and as you work your way up the tweets, you can tell when the play happens… and how my mind works. Hot fire. My Game 163 tweet got the most retweets. I love that everybody is still just as pissed as I am about that. Couldn’t sleep a wink last night. The internet didn’t either… more to come on this game. 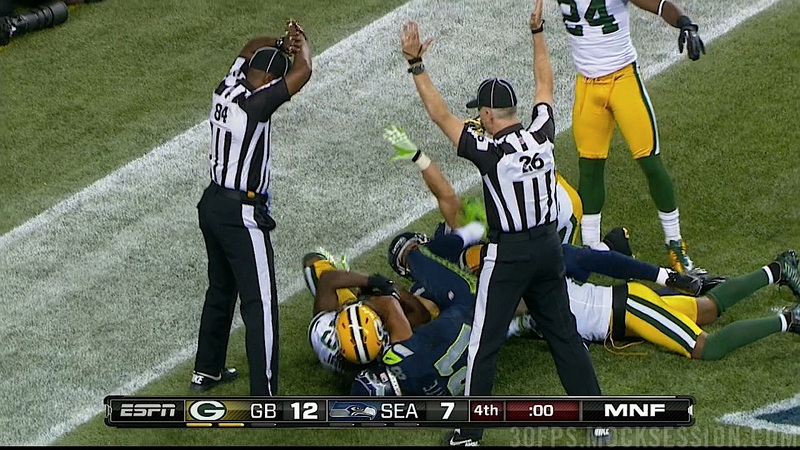 Long live the replacement refs!!! This entry was posted in Football, NFL and tagged Packers, replacement refs, seahawks, The Immaculate Touchception. Bookmark the permalink.